Interestingly, the EMC E4 was built prior to its E3 design. The model was also one of the final the builder produced before becoming an official division of General Motors. 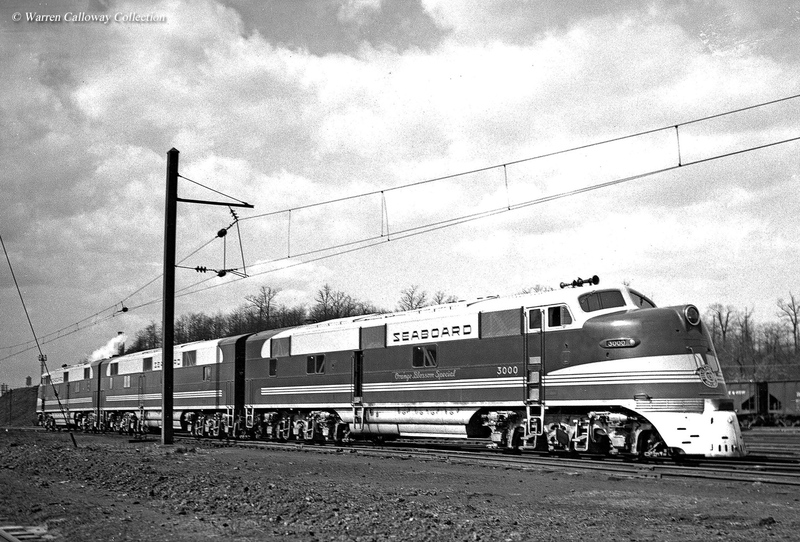 Aside from a few demonstrator models the Electro-Motive Corporation built the only E4s manufactured for the Seaboard Coast Line railroad and its new streamliner, the Silver Meteor, which debuted in 1939. The model was virtually identical to the E3 save for a few minor component differences (for instance, the E4 featured a a pneumatically-operated nose door to improve crew movements when two or more units were operating in tandem) and the Seaboard operated the units for more than 20 years before scrapping them all in the mid-1960s. Naturally, none remain preserved today although the E3 preserved at the North Carolina Transportation Museum gives one a good idea of how the E4 appeared. The EMC E4 was built only in 1939 and along with the E3 was the first such model to feature a GM prime mover (the model 567) and not a Winton engine. The E4 featured two 12-cylinder 567s enabling it to produce 2,000 horsepower. As with all other models up to that time the model was equipped with A1A-A1A trucks (meaning the two outer axles were powered and the center axle was not, this setup was virtually standard on all of the builder's passenger models throughout the years) and GM-built, model D7 traction motors. The locomotive offered the very same tractive effort as the E3; 56,500 pounds starting and 31,000 pounds continuous. Additionally, it offered both multiple unit control (MU) and dynamic braking ability. 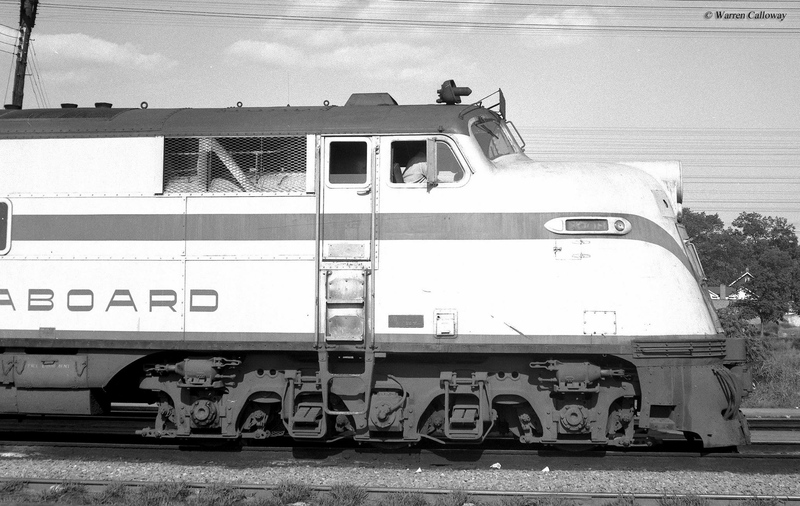 Essentially, the EMC E4 was another test model in that it was produced primarily for one railroad, the Seaboard, which used it to power its new streamliner, the Silver Meteor. 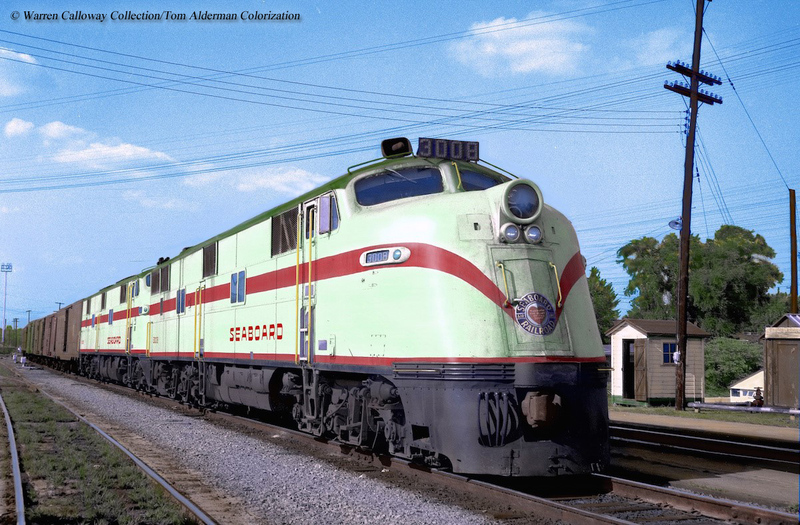 This train was the first streamlined passenger train to serve southern destinations. Working in conjunction with both the Pennsylvania Railroad and Florida East Coast Railway the SAL was able to market its Silver Meteor as a through train connecting New York City (at Pennsylvania Station) with Miami, Florida. Given the train's southern reaches it quickly became phenomenally successful with tourists and those looking to escape the cold weather of the Northeast. The railroad's rival, Atlantic Coast Line, was totally caught off-guard by this new train and quickly scrambled to catch up. It would release its own train that closely resembled the SAL's (in terms of markets served) just a few months later. To power the Meteor, the Seaboard ordered 13 E4As and 4 E4Bs. Along with an E4A-B demonstrator set, a total of 19 units were built. 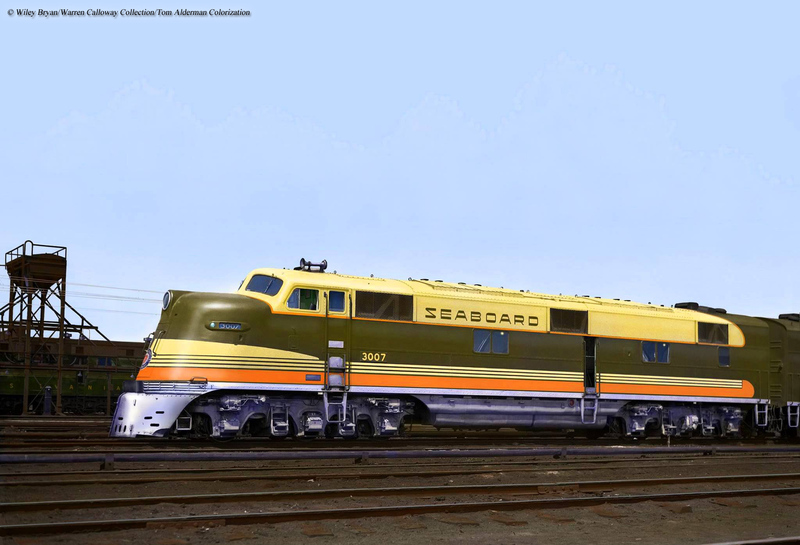 The Electro-Motive Corporation began delivering the E4s to the Seaboard in October, 1938 beginning with E4As 3000-3005, that continued to arrive through that December. Beginning in November, its first E4Bs began arriving, 3100-3102. A month later in January, 1939 SAL received E4A 3006. No more new models arrived until March of that year when E4A 3013 was delivered (former demonstrator #1939) and E4B 3104 (former demonstrator #1939B). The company's last batch of units arrived in late 1939; in November it began receiving its final A units 3007-3012 that continued to be delivered through December. And lastly, also that same month it received its final B unit, 3103. 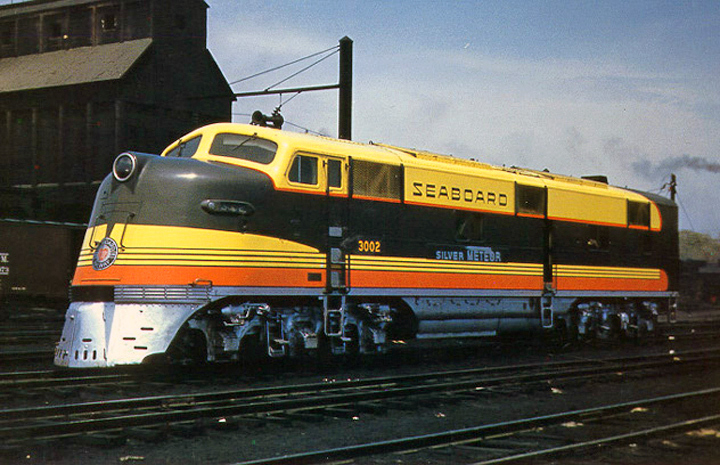 The Seaboard operated their E4s for more than 25 years before retiring them in 1964. In their place the company used newer models like the E8 and E9 that they had purchased in the 1950s and 1960s (its first large order of new E models arrived after World War II with the E7s).